I haven’t posted anything on Emptynestbirder.com since September of last year. Not much of interest has happened to justify a report. I returned from Spain in August ready for back surgery to relieve the increasingly debilitating pain that I had experienced all year. On October 31 I had a laminectomy, which has been successful. Recovery has taken a few months and is somewhat complicated by hip problems that may require hip replacement in the near future. Suffice to say, since August last year I have not travelled out of Iowa and therefore there were no interesting birding results to post. On the other hand, I have increased my concentration on my own back yard. I have kept a birding journal for quite a number of years. In it I note the species seen each year in (1) my yard, (2) in Iowa, and (3) in North America. I spent a lot more time in my yard in 2013, especially since August, than in any prior year, and I did set a new record for species recorded in here in 2013: 110. The previous annual counts ranged from 94 to 104. The total number of species seen in my yard since we moved here in 1985 is 153. At this point a new yard species is rare and good reason for celebration. The count thus far in 2014 has been rather small compared to similar periods in prior years: 26 to date. Nothing unusual has shown up, although the attractive Fox Sparrow that came to my feeder during the most inclement of our inclement weather is somewhat uncommon here in winter. Eastern Bluebirds, normally seen in January, did not show up until today. I have been able to drive around central Iowa on a few of our nicer days to see what other birds may be moving about. The best of those is the male White-winged Scoter, a very unusual bird for Iowa, that has been fishing below the Red Rock Dam, about 40 miles away, for the past 2 weeks. The northern birds that often invade Iowa in harsh winters have been notably absent this winter. Snowy Owls have been somewhat of an exception and a number of them have been seen about the state. Others, such as Purple Finches, Pine Siskins, and Red-breasted Nuthatches that I sometimes see in winter have been absent from my yard and largely absent from Iowa this year. The food supply must be good in Canada. The scarcity of birds has been offset somewhat by the large number and variety of mammals that have frequented my yard this year. They include numerous White-tailed Deer and Fox Squirrels, plus occasional Raccoons, Cottontail Rabbits, Coyotes, and Red Foxes. 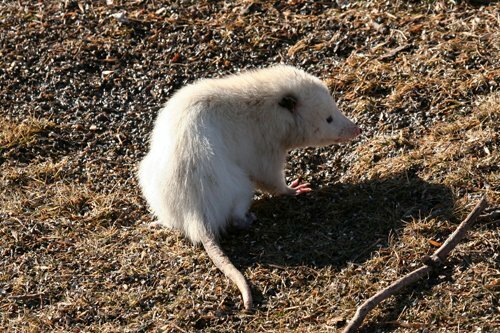 Yesterday a very rare white Possum (“Opossum”) came to clean up the seeds fallen from my bird feeder. I suspect this is the same individual that I saw in the woods behind our house several years ago, when it was a half-grown juvenile. Because of its obvious divergent coloration I wondered if it would survive, but it seems to have. Barbara was able to get some pictures of it. 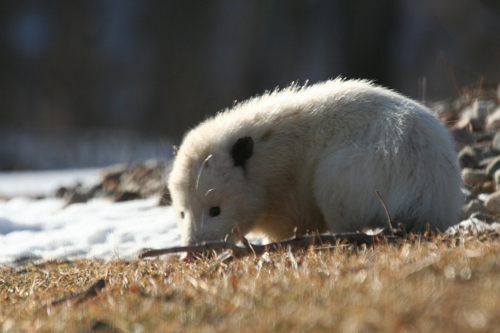 I think that it is not truly an albino, but rather a leucistic variant, because the eyes appear to be dark, rather than the distinctive albino pink. What a strange animal. How it survives our winters, especially this one, is a mystery to me I am really hoping that one day I will spot a Bobcat in my back yard. Very surprisingly, they are increasing in Iowa and I keep thinking that one will show up here, but none has, so far. Bobcats were common in Iowa before settlement in the 1800s. By the 1980s they were practically extirpated here. Since then, they have increased steadily in southern and western Iowa, with a current estimated population of 3000. The Iowa Department of Natural Resources now allows trapping or hunting bobcats in about 40 of our 99 counties. I hope that doesn’t cause a severe decrease in the number of these beautiful creatures in our state. Some consider them a pest because they do take a number of our birds, especially game birds such as pheasants and bobwhite quail. I guess it is all a matter of balance.